Last week I’ve presented the PL/SQL Cop tool suite to a customer in Germany. 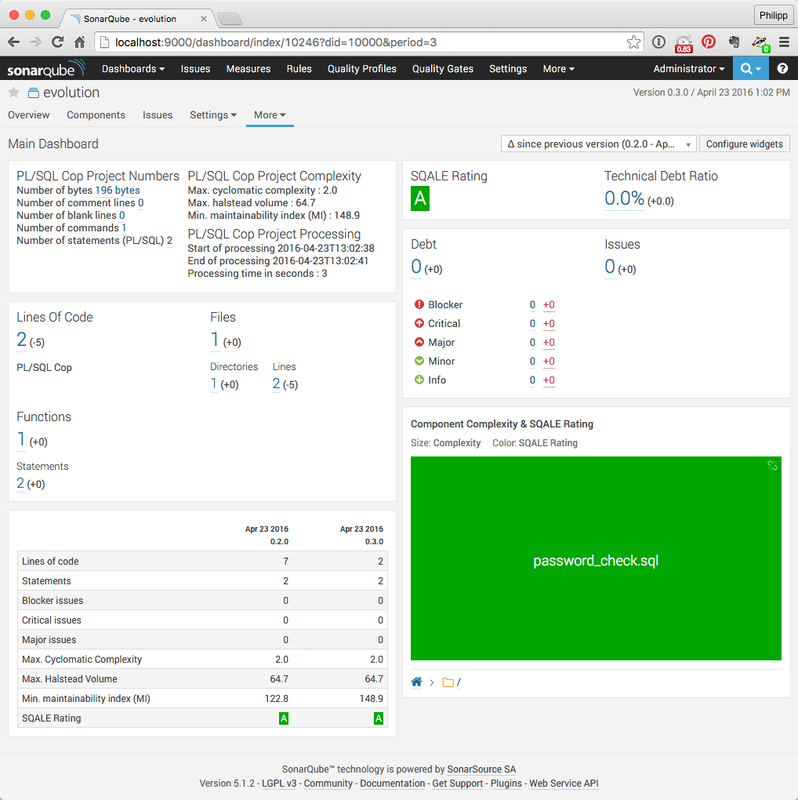 While preparing the demo I had taken my first deeper look at the PL/SQL Cop SonarQube plugin, written by Peter Rohner, a fellow Trivadian. 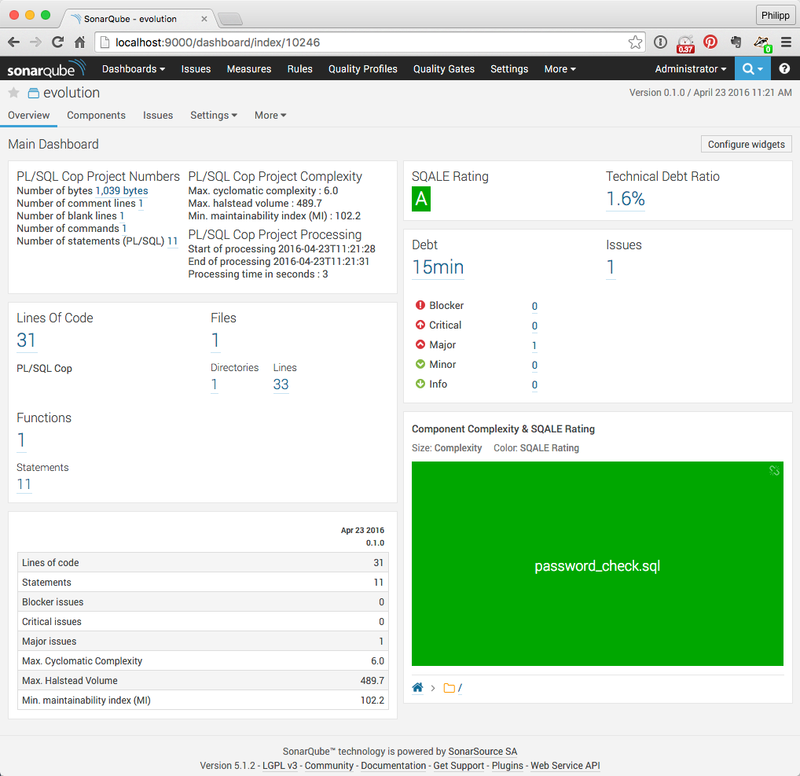 I was impressed how well the additional PL/SQL Cop metrics integrate into SonarQube and how easy it is to monitor the code evolution. Before I show the code evolution I will go through the metric definitions based on fairly simple example. If you are not interested in the math, then feel free to skip reading the metric sections. As a starting point I use the following simplified password verification procedure, which ensures that every password contains a digit. I know this procedure is not a candidate for “good PL/SQL code”, but nonetheless it is based on a real live example. The goal of this piece of code is to explain some metrics, before starting to improve the code. After running this code through PL/SQL Cop I get the following metrics. I show here just the SonarQube output, but the results are the same for the command line utility and the SQL Developer extension of SQL Cop. Here are the definitions of the simple metrics shown above. Simple metrics such as Lines of Code are an easy way to categorise the programs in a project. But the program with the most lines of code does not necessarily have to be the most complex one. Other metrics are better suited to identify the complex parts of a project. But it is important to have a good idea how such metrics are calculated, because no single metric is perfect. I typically identify programs to have a closer look at by a combination of metrics such as lines of code, statements, cyclomatic complexity and the number of severe issues. 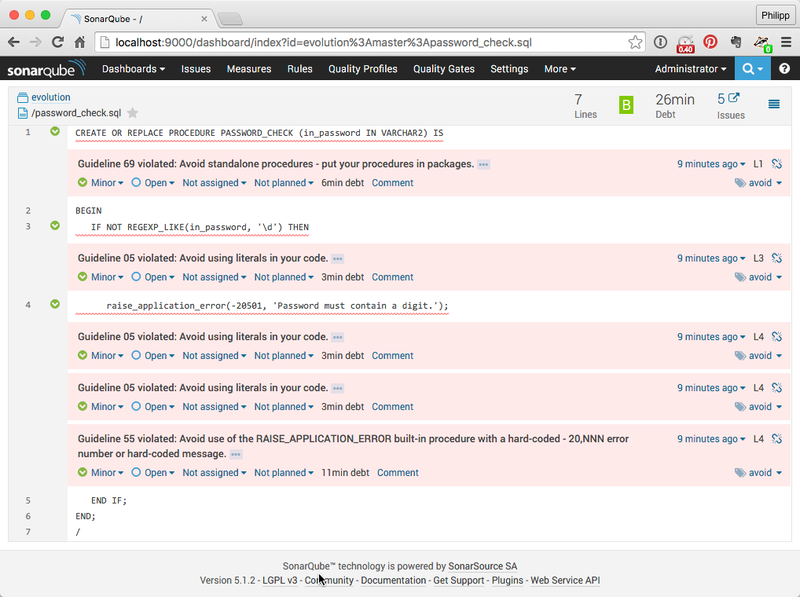 See SonarQube documentation for the further metric definitions. Please note, that PL/SQL Cop does not calculate all metrics and some metrics are calculated a bit differently, e.g. Comment Lines. Based on the default SQALE Rating scheme, a project rated as “E” should be rewritten from scratch, since it would take more time to fix all issues. The higher the cyclomatic complexity, the more difficult it is to maintain the code. Please note that PL/SQL Cop V1.0.16 adds an additional edge for ELSE branches in IF/CASE statements, for PL/SQL blocks and for GOTO statements. I consider this a bug. However, Toad Code Analysis (Xpert) calculates the Cyclomatic Complexity the very same way. PL/SQL Cop calculates the Cyclomatic Complexity per program unit and provides the aggregated Max. Cyclomatic Complexity on file level. The higher the Halstead volume, the more difficult it is to maintain the code. PL/SQL Cop calculates the Halstead Volume per program unit and provides the aggregated Max. Halstead Volume on file level. The lower the maintainability index, the more difficult it is to maintain the code. PL/SQL Cop calculates the Maintainability Index per program unit and provides the aggregated Min. Maintainability Index on file level. Almost all metrics look better now. But instead of 1 major issue I have now 5 minor ones. This leads to a higher Technical Dept Ratio and a bad trend in this area. So let’s see what these minor issues are. The differences/improvement to the previous version is shown in parenthesis. Password_Check, Version 0.3 – Even Better? Reducing the number of lines from 7 to 2 leads to better Maintainability Index, but the number of statements, the Cyclomatic Complexity and Halstead Volume are still the same. The change from version 0.2 to 0.3 reduces the readability of the code and has a negative value. That clearly shows, that the Maintainability Index has its flaws (see also https://avandeursen.com/2014/08/29/think-twice-before-using-the-maintainability-index/). There are various ways to discourage such kind of changes in a project. Using a formatter/beautifier with agreed settings is my favourite. 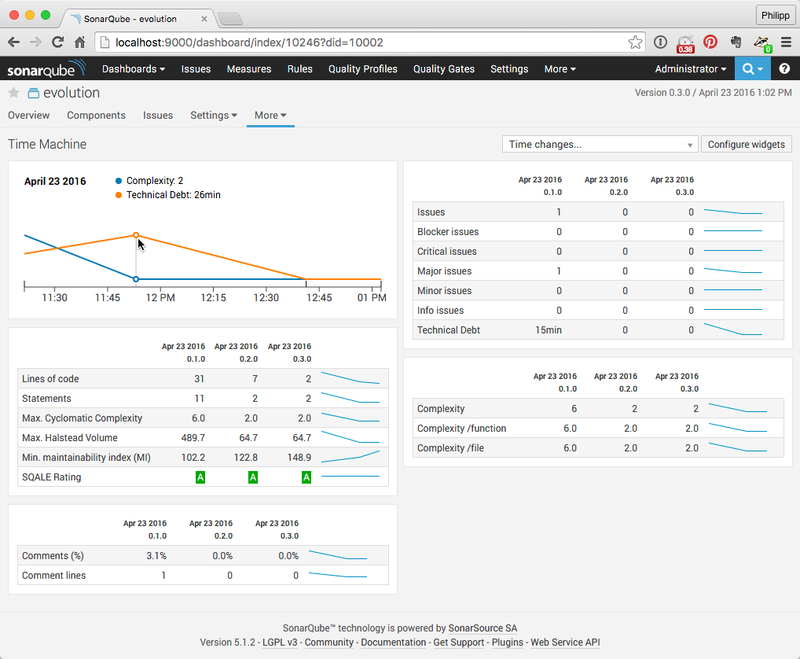 SonarQube shows the metrics of the latest two versions in the dashboard. Use the Time Machine page to show metrics of more than two versions of project. 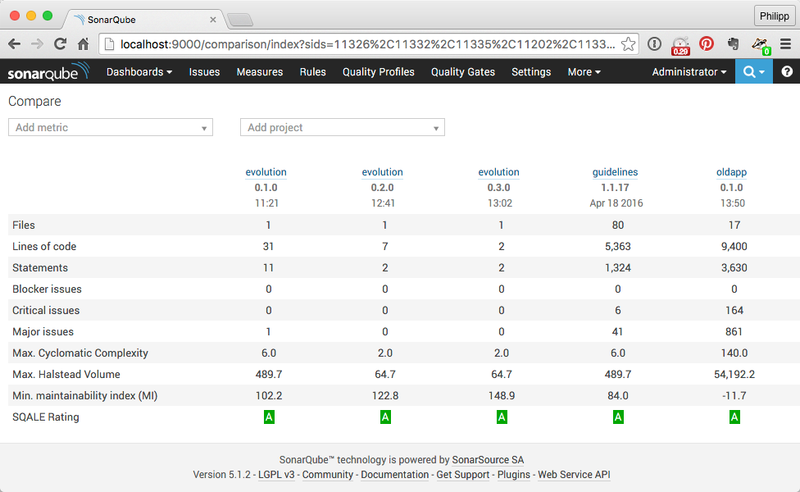 Or use the Compare page to compare metrics between versions or projects. But these metrics are still useful to identify complex programs, to measure code evolution (improvements, degradations) and to help you writing better PL/SQL, if you do not trust in metrics blindly.